I don't know if it's the killer job writer Dan Abnett did on Force Works, Guardians of the Galaxy, the original Legion Lost mini-series or growing up reading about Hercules making Galactus drunk in the back of the Marvel UK Transformers comics, but I am giddily excited about today's exclusive CBR announcement of a new Hercules series coming soon from Marvel. Yes, I used the term 'giddily'. Joined by artist Luke Ross, the November #1 starts a trek for the demigod to reclaim the mantle of champion and hero he held thousands of years ago, by stamping his authority on the diminishing mythological matters in our modern world and more. 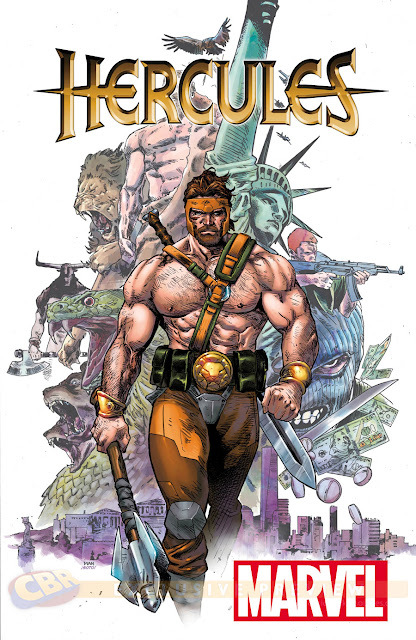 Says Dan on CBR: "[Hercules is] still very genial and quite funny, but he's also decided it's time he got back in shape and got his career back together again. In doing so I hope he's showing that not only is he the world's first super-hero, but he's this extraordinary capable warrior and hunter." While hopefully this journey will bring him into contact with his former allies from super-team The Champions, the series looks set to kick off with "seemingly done in one" issues and fellow former Avenger, Gilgamesh as a flatmate/protege. Sure Herc has been a Champion, Avenger, a Hero for Hire and more, but as the cosmic level hero takes to the streets, one final quote from Dan proves how magic this series will prove to be. "He's an extraordinary hero who's enormously capable, beloved by the gods, and will do anything to protect and look after you if he's on your side. He's also capable though of enormous foolishness, violent rage, and terrible decision making." - hey, aren't we all. Huh. Interesting. I hope the series does well, and is allowed to do well and tell its story. Herc's kinda iffy when it comes to his own solo series, so here's hoping he impresses enough to go the distance. And Gilgamesh too? I rcently saw his redesigned look from the last Eternal series, and wow! Waaaaaaay better than the bull mascot-looking outfit he wore back in the 80's. That caught me to Dale, except I thought Gilgamesh died in The Crossing storyline through all the Iron Man related titles in the 90's, and wasn't aware he had been brought back. Guess that's comics for ya!